The Mateo Single Lever Pull Out Faucet has a streamlined silhouette that coordinates with any kitchen sink, with a three-function sprayhead for maximum efficiency. This faucet is made with top-quality components in order to ensure superior performance and durability. A QuickDock mounting assembly eliminates the need to secure the faucet underneath the sink, making top mount installation exceptionally easy. This 3000 series kitchen faucet is a classic style with smooth and simple curves. Highlighted by a high arc spout design and decorative lever handles, this faucet also gives off a beautiful shine with its chrome finish. With its transitional design that will match most any decor, the 3000 series is an easy choice for your next home remodelling project. The Glacier Bay Market Pull-Out Kitchen Faucet in Polished Chrome features an elegant, transitional style design that will compliment a variety kitchen dicor. 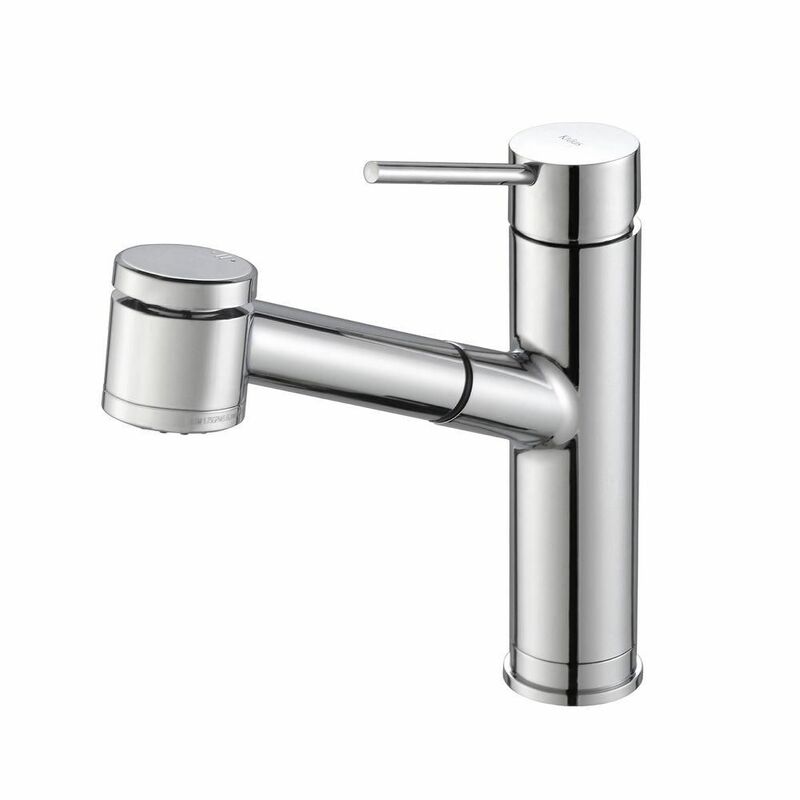 Its single lever handle meets ADA standards for ease of use in adjusting water temperature and volume. The pull-out sprayer features an aerated spray and a new TurboSpray that is exclusive to Glacier Bay. The TurboSpray from Glacier Bay provides a stronger spray pattern than your standard pullout faucet. The sprayer also includes a 48 in braided hose for an extended reach, making it ideal for filling large pots and pans or washing down the sink. This kitchen faucet also includes the exclusive FastMount mounting system to make installation quicker and easier. MateoSingle Lever Pull Out Kitchen Faucet Chrome The Mateo Single Lever Pull Out Faucet has a streamlined silhouette that coordinates with any kitchen sink, with a three-function sprayhead for maximum efficiency. This faucet is made with top-quality components in order to ensure superior performance and durability. A QuickDock mounting assembly eliminates the need to secure the faucet underneath the sink, making top mount installation exceptionally easy. MateoSingle Lever Pull Out Kitchen Faucet Chrome is rated 4.6 out of 5 by 39. Rated 5 out of 5 by debhonda from High quality and unique faucet Really love my new faucet. It is simple yet unique! Rated 2 out of 5 by Disappointed from Poor quality and short life I loved this faucet when I got it, easy to install and perfect. But now, less than a year and a half after installation, the "chrome" has developed a gouge that shows it's actually plastic. The tap also drips out of the spray holes when it's not set on spray. Looks like this pretty tap is actually a dud that will have to be replace less than 2 years after purchase. Beware!!! Rated 5 out of 5 by Klaus from Excellent design Installation, fastening from top is a very good feature for DIY installers. Top operating means you do not have to reach through the water stream to adjust water temperature. Easy to operate with wet hands as happens when cleaning dishes. I personally like chrome finish better than brushed stainless steel finish for a fast polish of the faucet. Rated 5 out of 5 by Saji from Good faucet. ... Good faucet. Rated 5 out of 5 by Pyt from This unit was installed by my plumber without any problems. It’s size doesn’t overwhelm my sink ... This unit was installed by my plumber without any problems. It’s size doesn’t overwhelm my sink nor obstruct the view out of my kitchen window. The on off lever enables me to operate the water temp and flow with a wrist when my hands are messy. I’m happy with it, but can’t comment on its longtime reliability. Does this product come with a deck plate?